If you are unable to travel to Nashville to attend Desert Oasis 2019, you can purchase a ticket to watch the LIVE broadcast from the convenience of your home! 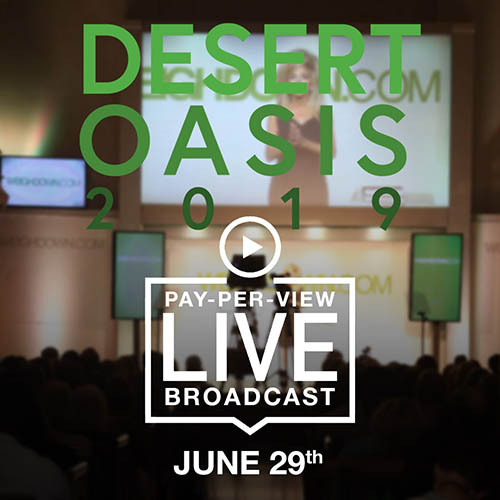 Register today for access to the pay-per-view LIVE broadcast of Gwen Shamblin Lara and the Weigh Down Staff as they present "Desert Oasis 2019," a powerful weight loss seminar filled with instruction and inspiring success stories. Previous attendees testify that this event was just what they needed to push them forward with permanent weight loss. Once you register, you will receive an e-mail with a link to the LIVE broadcast on June 29th. We'll send reminders via e-mail as Desert Oasis 2019 approaches. You can also come back here to Store.WeighDown.com and Login, where you will see a link in our store navigation bar for "Desert Oasis LIVE." This link is ONLY visible to those who have purchased access to the Desert Oasis 2019 LIVE broadcast. You can test your ability to watch the videos starting today. We have a test video available as soon as you purchase your access. If you have any trouble, please e-mail us at info@weighdown.com or call us at 800-844-5208!